Perched atop the majestic hills of Paphos lies the Aphrodite Hills Resort, looking out over the beautiful expanse of the Mediterranean sea, this opulent paradise is one of the top golf resorts in Europe. The perfect blend of 5-star luxury and championship golf, Aphrodite Hills offers holidaymakers a truly special golf break. 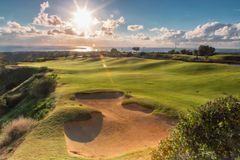 The PGA National Cyprus has become a world-class golf course and a must-play in the Mediterranean, leading to Aphrodite Hills being named European Golf Resort of the Year for 2018. Located just a 15-minute drive from Paphos International Airport, Aphrodite Hills is easy to access for anyone travelling from the UK and benefits from Cyprus’ golf-friendly climate. A warm Cypriot welcome awaits at the resort’s spectacular hotel, the 290-room accommodation offers everything you would expect of a 5-star establishment. Your overall experience at Aphrodite Hills is guaranteed to be out of this world, a golf trip you’ll be talking about for years to come. Spanning the contours of the landscape's two plateaus, Aphrodite Hills is carved through lakes, carob trees and delightful olive groves, all of which are part of its immediate position among the elite of European golf. With a view towards hosting prestigious international professional tournaments, Aphrodite Hills can be set up to test even the finest players, as evidenced when it hosted the prestigious PGA Europro Tour Championship in 2010. However, it is essentially a resort course, and as such the variety of tees ensures that this course also remains playable for the average visitor. The course spans the magnificent cliff-tops to the south of Paphos, and affords incredible views of the coastline. Robinson has also used this landscape to create a number of awe-inspiring holes; the most notable are the short 7th, at the foot of a gaping ravine, and the nerve-jangling island green at the long closing hole. Having been recently renovated in 2017, the course does justice to both the 5* quality and the natural beauty that are the trademarks of the resort, and should ensure a truly memorable golf holiday at Aphrodite Hills. Aphrodite Hills boasts a top quality academy; sharpen your skills at the double-ended range, the dedicated short game zone, or the three-hole academy course. "If you can carry 200 metres with your driver, you should try the back tee on the 3rd. It looks forever over the gorge, but it is only that far to reach safety. It is a thrill of a lifetime shot if you succeed. The 7th deep within the bowels of the canyon is another dramatic shot, while fantastic sea views are to be had at the 8th and 15th. Personally I think reaching for the back pin position on the 12th needs the most courage, while the 16th is my pick for the toughest par 4, and the 18th is a reachable and wonderful par 5. Overlooking the Petra tou Romiou (Aphrodite's Rock), the Aphrodite Hills Resort Hotel is a deluxe 5* destination, offering the finest accommodation at the heart of one of Europe's most exclusive new resorts. Perfectly located for the myriad of golf, leisure and wellness activities, the hotel boasts 290 luxurious guest rooms and suites, with a comprehensive range to suit every demand. Every room benefits from a private balcony or terrace, from which you can overlook the golf course, the lovely gardens, the pool or the coastline below, while the standard room facilities are outstanding; every room has a deluxe bathroom with separate walk-in bath and shower, bathrobes, a mini-bar, safe deposit box, dataport telephones, satellite television and full air-conditioning. Both the hotel's façade and interior are decorated in a classical Mediterranean style, and the 5* quality is evident from first to last at Aphrodite Hills, which has quickly emerged as a premier luxury golf holiday destination. The Retreat Spa is located at the heart of the resort and is a haven of calm, serenity and tranquillity, where the treatments are pure indulgence. In conjunction with the luxury Pevonia product range, the spa offers everything from specialised hydrotherapy, manicures and pedicures and massages. There are a total of 24 treatment rooms, as well as garden massage huts, many of which overlook the sea. At the centre of the Retreat is the Thermae; a throwback to the Greco-Roman ritual of daily bathing, the Thermae is an incredible hydrotherapy complex built around a great central colonnade. Aphrodite Hills has four championship standard floodlit tennis courts, while there are plans to build a multi-court tournament arena. Hotel guests can take advantage of The Cove, a private pebbled beach accessed by shuttle, and the resort's amazing swimming pools, as well as the sauna and spa pool. The focal point of the resort is the Village Square; with bars and restaurants, it the perfect meeting place, and also has a bank, chapel, pharmacy, market and a number of designer boutiques. The Golf Lounge is a stunning bar and restaurant, where golfers can get together to dissect the day's events. The Clubhouse Restaurant serves a 5* menu, packed full of regional favourites and international classics. Note: Half board & Full board guests entitlement can only be utilised within hotel restaurants, plus all Hotel & Resort restaurants are operated on a rotation basis and in accordance with seasonal demand. The Pegasus Kids Club will ensure that 4 to 14 year-olds will have a memorable and sociable holiday, with a great range of activities. Aphrodite Hills Resort has a choice of two nearby beaches for guests to lie back, relax and simply enjoy. The beach clubs are open between May and October. Zias Beach Club is located within 15 minutes drive from the Resort, with transfers available from the Hotel Reception. Zias Beach Club is a pebbled/sandy, child-friendly beach. This beach club consists of two areas - the complimentary beach facilities (sun beds, umbrellas, beach towels), plus the bar and restaurant facilities. Excellent hotel. Only complaint is that the buffet style food was not always very hot. Excellent. Very well sited room.Warn clients that village square facilities are not open in low season so need half board not b and b unless have a car to go elsewhere. we upgraded to hb. There were only 1 or 2 choices for food every night in December with about 6 restaurants closed due to off-season. No local food was on offer which was the biggest disappointment of the trip. However, the staff were fantastic and Laura at the Anoi pub was keeping the whole thing going almost single-handed.... The room was excellent with views over the course and impeccably clean. Taxi into Paphos for Greek food helped overcome the lack of local cuisine in the hotel (about 65 euros return). Marshalls kept games moving warning 4 balls to let us 2 ball through. Excellent ground staff effort. Resort allows anyone on course, rounds take ridiculous amount of time even with buggies. Ladies in proshop not customer service orientated and rude. Rangers on course did the best they could with slow play. Quite an experience, as the course is spread across a huge ravine, so buggies were mandatory (but free) and the paths were vertiginous! Greens tricky, but lovely course overall. Staff all really friendly and helpful. Practice facilities very good. The course was in excellent condition for December, there were many varied holes with some very challenging tee positions if you choose to play off the back tees! Took our own clubs so not sure what clubs to hire were like but staff there were very accommodating and facilities were excellent. 3rd green was very poor and around all the fringes of the greens were very poor very little grass. not value for what we paid.